EVANSTON, Ill. - They're called leggings - popular fashion items that are tight-fitting pants to some, and glorified tights to others. Younger girls often wear them as pants with little fuss. But as those same girls approach middle school, leggings have become a clothing accessory that's increasingly controversial - and seemingly, the favorite new target of the school dress code. It might seem a reasonable enough request at a time when school dress codes - and even school uniforms - are common and often supported by teachers and administrators who frequently complain about students who push the limits of good taste, and the parents who let them (and may even push those limits themselves). Judges have tended to side with schools when safety is a concern. For example, a federal court agreed with a school district in Morgan Hill, Calif., after some high school students were told not to wear American flag T-shirts on the Mexican holiday of Cinco de Mayo in 2010. The worry was that the shirts would incite conflict with the school's many Hispanic students. It's not always easy, since many people have a different notion of what's appropriate and what's not - and what's distracting, and what's not. The discussions at school meetings have sometimes bordered on silly. But few disagree that there are serious issues at hand here - among them, whether girls are being shamed and unnecessarily embarrassed at a time when they're already starting to feel more aware of their changing bodies. "The notion that girls' clothing affects the way boys learn is not, and never will be, our message," the statement said. However, parents who've attended school meetings, and students who dislike the policy, seem most troubled by an inconsistency in enforcement. They claim that some girls are "dress-coded" more than others, perhaps because they are more physically developed. They say, for example, that they have heard comments like, "If you were smaller, you could wear this and it would be fine." "I've also seen skinny, smaller girls walking around in leggings every week and never, ever getting caught for it," says Kate Green, a seventh-grader at Haven who concedes that she probably fits that category herself. She's had warnings, she said, but never more than that, when other girls have had to put their gym shorts over their outfits if they're in dress code violation. Parents Kevin and Juliet Bond wrote an open letter to the district after their 13-year-old daughter Lilly sensed unfairness and asked them to address it. "It's not like these girls are dressing up like street corner gals, right? I mean, it's sweatshirts and comfy pants," says Juliet Bond, an author and professor of women's studies at a Chicago liberal arts college. Members of the advisory board say the dress code policy will be reviewed for the next school year. The key, school board member Suni Kartha said, would be to come up with a clear, consistent policy with as little "judgment" as possible. "I don't think anybody ever had the intention for the policy to ever shame any of the students, but I understand that that's the effect," Kartha said. "We were always pro dress code. Now I think, 'Is it really that important?'" says Jamie Renfro. 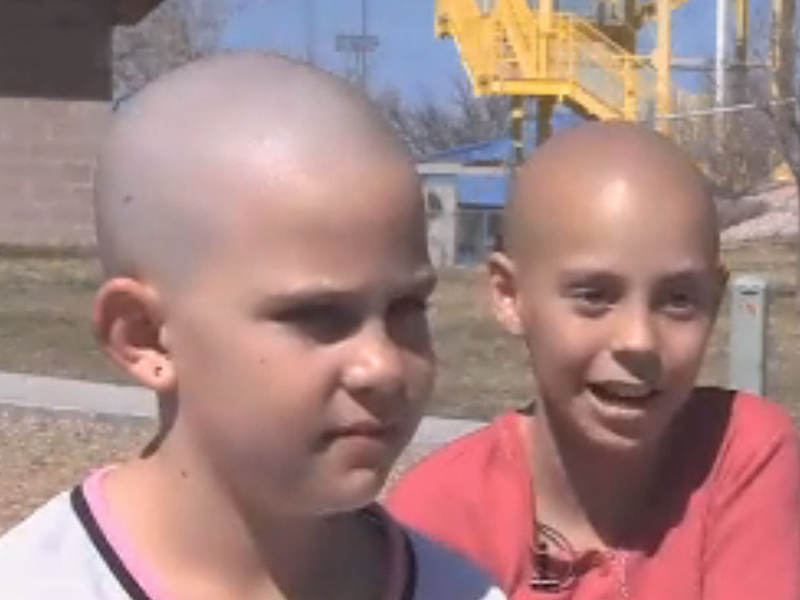 She's the mother of a third-grader Kamryn Renfro, who recently gained national attention when she decided to shave her head to support her 11-year-old friend Delaney Clements, who has cancer and lost her hair after chemotherapy. After she shaved her head, 9-year-old Kamryn was suspended from her public charter school in Grand Junction, Colo. - though the school's board quickly reversed the decision. Now, because of her daughter's experience, Renfro says she catches herself paying attention at school events to dress code violations - earrings that might be too big, or a boy's hair that is longer than shoulder length. "But does the length of the kids' hair doesn't necessarily affect them in the classroom?" she asks. "I really doubt it does." Haley Bocanegra, a 17-year-old junior from Riverside, Ill., regularly pushes the limits even further at her school, sometimes dressing like a boy, or wearing wigs and goggles for a "Steampunk" outfit, or a Japanese anime costume. She says teachers usually have a harder time with it than her classmates do. At least one former teacher who's now an expert in education law advises schools to continue to focus instead on safety - and to ignore students' unusual dress, if it's not disruptive or disrespectful in some way. Beyond that, Nancy Hablutzel, a professor of education at the Chicago-Kent College of Law, says consistency is important. "But," she says, "so is common sense."